It sure was an exciting week! 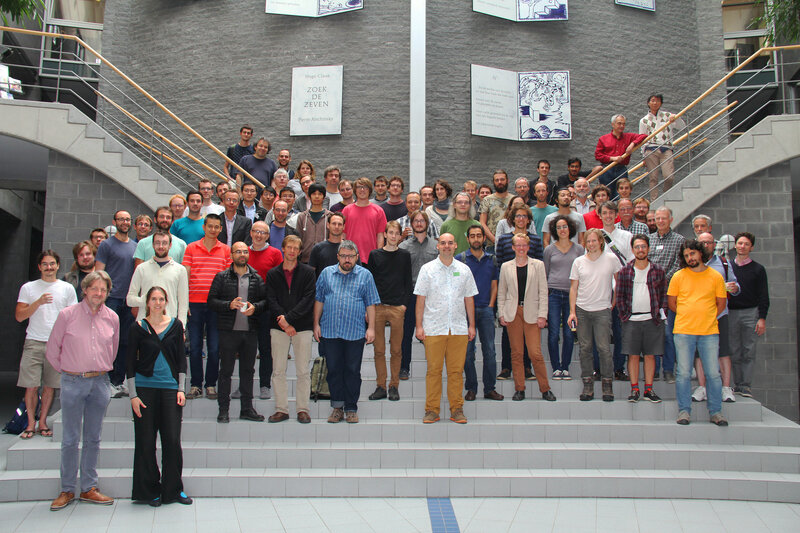 Also, the conference picture is available (thanks to Dennis Presotto's camera, and Mieke De Mulder's photography skills). Do not let the picture trick you into thinking that I am as tall as Michael Wemyss, I had the advantage of standing one step higher, and still I'm smaller. Very soon there should be notes made by the participants on the website. continuining the theme of the conference, started by Ragnar. The functor is faithful and conservative, just like me. I have seen Amnon Neeman give a lecture series on the result he talked about, so the lecture itself didn't contain anything new for me. But I still find it amazing that de Jong's regular alterations have found an application in the study of dimensions of triangulated categories, and I hope the published paper will be available soon for everyone to see. The talk by Greg Stevenson discussed a situation in which there is a singularity category and a cosingularity category (which is somehow related to the qgr construction in noncommutative algebraic geometry à la Artin–Zhang), and how they are related in a suitable nice situation. I need to digest the examples a little more to really say something meaningful. The first talk was by Tony Pantev, and he discussed an interesting work in progress of the trio Pantev–Katzarkov–Katzarkov. They are developing a dg version of the works of Rosenberg (available on his in memoriam website) which are in the setting of abelian categories. Their goal is to study Fukaya categories, which often do not have generators, but as a fun application of their framework one can already consider the situation of algebraic geometry where using Bondal–Van den Bergh the dg categories that appear do have generators, hence they are “dg affine” (something which is certainly not true on the abelian level), so it makes sense to describe localisations of these dg algebras. Do I look like Yuri Gagarin? Together with Agnieszka Bodzenta he is working on studying derived categories of smooth projective varieties related by a birational morphism, turning earlier work of Bridgeland and Van den Bergh into a general framework. I am very much looking forward to reading the final paper, which already in the surface case should lead to fun examples.